This article is about a Meridian Ocean crew. For the Emerald Ocean flag, see Dark Revenge (Hunter flag). Dark Revenge is a crew on the Meridian Ocean, flying the flag of Imperial Coalition. Dark Revenge was once the largest crew in the flag of Tommy Gun. 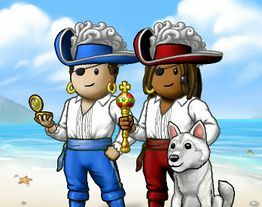 The crew was originally created on the retired Viridian Ocean on June 13, 2005 by Deadleader, who remained captain until November of 2005 when he turned the crew over to his first mate Jollyjoe. Jollyjoe later created his own crew, Viridian Crusaders, and Deadleader picked up the captaincy of Dark Revenge once again. The captain position was then passed over to Hayk, then to Illegitimate. When Hayk came back to power, he merged the crew with the Squid Squad. But Illegitimate, Orhanbaba and Heartslayerr rescued Dark Revenge's name and recreated the crew, and after a few weeks, Zwartetulp joined. On April 2nd, 2009, Illegitimate passed over the captaincy to Dudusierra. Dudusierra, together with the senior officers Maxmee and Kikas, built two shipyards to build ships for the crew-mates, and to start making a Sea Monster Hunting and flotilla fleet for Dark Revenge. On August 23rd, 2009, the captain Dudusierra gave the captaincy back to Illegitimate, when he founded his new crew, Pillars of Eternity, together with three senior officers of Dark Revenge, who convinced him to come. After Illegitimate had been captain for almost three years, he made Zwartetulp captain on the March 11, 2011. What nobody knew was that two months later Illegitimate would die cause of a heart-attack. Zwartetulp successfully held the crew together and was able together whit his crewbies to get Dark Revenge to rank 5 for two weeks. After Zwartetulp had been captain for eight months in rough times (since the death of Captain Illegitimate) he took a break and gave control to Heartslayerr for the month of December. In the month August of 2012 Zwartetulp attacked Ansel Island and won it! In this time, Abrum had joined the crew. The crew returned to Sea Wrath for nearly a year. While in Sea Wrath, Zwartetulp led the crew to capturing and holding Carmine Island. The crew later lost Carmine. After a long period of dormancy, the crew was passed on to Alddar, who held the position of captain for a month before returning the crew to Zwartetulp. The crew then returned to Alria, where it currently resides. The crew remained dormant while Zwartetulp dealt with real life, until Abrum led the Senior Officers to pillage and recruit. After only two weeks under his leadership, the crew had returned to over 100 members for the first time in over a year, and had reached 1st place on the Meridian's Fame list. Zwartetulp had since returned the lead the crew. In real life, Zwartetulp had been preparing for university, and so made moves to leave the game. Near the end of 2014, he gave the crew to Abrum, making him Captain. Zwartetulp left the game not long after. Abrum would eventually become King of Alria for nearly half a year following Dudusierra's departure. Abrum helped revive the flag, while keeping Dark Revenge active. The title of King was returned to Dudusierra when he returned, and Abrum went dormant to focus on his new job and house. During this time, Dark Revenge was moved to the flag Imperial Coalition. This event followed a sudden shift in royalty in Alria that Abrum and Zwartetulp had disagreements with. The crew still resides in the Imperial Coalition. As of November 22nd, 2015, Abrum has returned to lead the Dark Revenge, along with his first mates Dragonic and Captainbroom (Blackbeardxz's new pirate). Fleet officer: 2 Solids or 4 broads AT LEAST! Have 2 respected+, and be trusted. example: sloop - 30 Fine Rum and 100 Small Bannonballs. Know how to chart a course. Know how to job pirates and engage and disengage ships. Know how to divide the booty. Know how to plank.. type /plank and pirate name. Plank people who are disconnected especially in battle. Know what ship is in our flag.. and never attack our flag ships. Know how much cannonballs to max the different type ship. Balls of Steel on Napi Peak. Marleybone's Tailoring Stall on Lima Island.